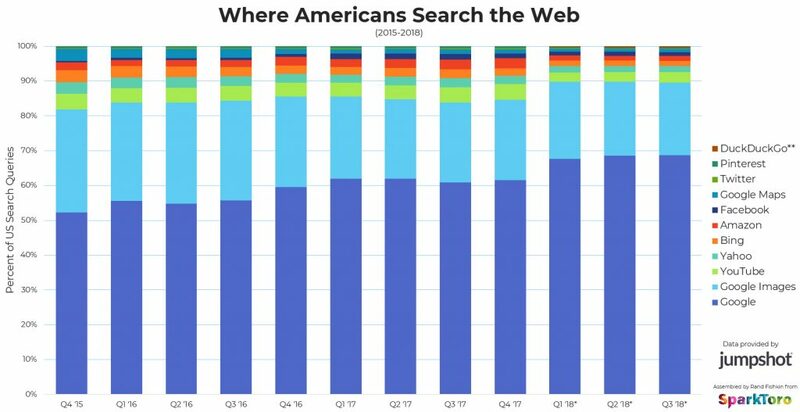 For many years, there have been pervasive myths about where Americans search on the web, whether search is dying, whether Amazon (or Facebook, or Bing) is taking Google’s market share, and plenty more. Thanks to new data generously compiled for SparkToro from Jumpshot, a clickstream data provider that monitors more than 10 million desktop and mobile devices in the US, we’ve got some high quality answers. No one has a vested interest in sharing real data about Google’s market share. For Google, putting this data on display could subject them to further scrutiny by the FTC as a monopoly. For Microsoft, the numbers are embarrassing, and could cause investors or onlookers to question their ability to compete. But as any savvy marketer with access to their website’s analytics knows, Google sends the overwhelming majority of search traffic. This data is backed up by StatCounter’s numbers, so it’s not just Jumpshot saying this is true. Furthermore, when I compared DuckDuckGo’s recent announcement about crossing 30 million daily searches, and compared it to the growth numbers from Jumpshot, the figures were within 5% — suggesting that even at the low end of the volume spectrum, Jumpshot’s got their accuracy dialed into reality. Reality: Google’s ownership of search has been remarkably stable the last three years. In the past three years, Amazon’s share of overall web searches has gone from 2.2% (back in Q4 of 2015) to 1.5% (in Q3 of 2018). Product searches, specifically, may be another matter — a Jumpshot analysis showed that a little more than half of all product searches originate on Amazon (54%) vs. Google (46%). Those numbers were reversed in 2015, meaning Amazon’s gained ~8% of product search share the last three years. But, overall, Google receives 50X+ more searches than Amazon. Most of the change in landscape between 2015-2018 happened because of Google itself. The search giant wrapped more Maps searches into its Google.com web search interface, put YouTube videos more front-and-center in the web search results, and increased the percent of queries that showed Google Images in the web SERPs, too. These changes show clearly in the graph, as Google’s standard web search gains prominence. With the Y-Axis showing only the 88th percentile and above, Google.com (and its 65%+ of the market) is out of the picture, and Google Images is shown just at the bottom. It’s here that Amazon, Facebook, Twitter, and everyone else’s relative lack of movement is more apparent. The only entity showing true growth is DuckDuckGo (which fits with the numbers they’ve reported). Google Images accounts for more than 20% of all queries Americans performed in 2018, and that’s down from a high of nearly 30% three years ago. If you wonder why Google keeps putting more and more image results directly into the web search results, wonder no more. Demand for images is huge, and Google’s just giving the people what they want (without making them click that “Images” tab nearly as often). My hope (and Jumpshot’s) is that this data will prove useful for dismantling some of the more questionable claims of where searches take place on the web. I’m also working with the Jumpshot team on getting updated data for clickthrough rates in Google, data for the EU vs. the US, and some more information about who else (outside of Google) sends traffic on the web, and how that’s shifted. A big thanks to the amazing Shaun Rivera, who makes these posts and charts possible, to the entire Jumpshot team, and to DuckDuckGo and StatCounter, whose public, transparent numbers helped me validate the accuracy of the clickstream data shown here. p.s. For those interested, there’s more on Jumpshot’s methodology here. Source : BY RAND FISHKIN • OCTOBER, 2018.